When doing an arranged album, it helps immensely if the original material is of a good standard, as no amount of arranging can salvage dodgy themes. 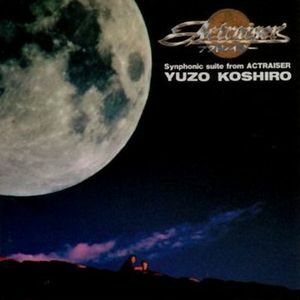 Thankfully, the score of the rather difficult game ActRaiser was quite good and Yuzo Koshiro has showed how splendid the soundtrack really is in this EP. Many have complained about the length of this arranged album, but it is simply the fact that ActRaiser is mainly a hack’n’slash game, rather than an RPG. This recording features most (if not all) of the main themes of the game, so even if the composer wanted to increase the length of the recording, it wouldn’t be possible. As soon as you press play, you are greeted with the regal tones of the French horn and then plunged into one of the most polished albums in game music history. The extreme competence of the orchestration and the powerful performances are surely what the composer envisaged whilst composing for the limited SNES soundchip. The arrangements sound so natural, fluid and spontaneous, it is hard to imagine that such music would be composed for any other media. You may have noticed the “intermizzo” tracks. A quick look through a music dictionary will show you that such a word does not exist, but the word “intermezzo” (which is simply the Italian equivalent of “interlude”) does. It is likely that it is just a spelling error rather than anything significant. However, the presence of these tracks point to one thing — that the album is meant to be listened to as a whole, much like multi-movement symphonies. And indeed it works as a whole. With such a wide gamut of moods, this album never becomes monotonous. This is due to the fact that most of the tracks on this disc are medleys. But far from sounding disjointed, the pieces flow into another remarkably well. For example, nobody would think the melancholic, serene “Sky Palace” would be the ideal piece to lead into the demonic, rage-driven “Bloodpool ~ Casandora”. Yet somehow, Yuzo Koshiro pulls it off. Of course, most would skip past the initial seven tracks just to get at that immensely memorable theme — “Birth of the People”. Though woefully short, gamers will remember this theme the most, as it supplements the their frustration of trying to get rid of those damn monster nests. This is a listening experience that few will forget — the excellent arrangements and great performances certainly deserve the praise it receives. Though few will care about such things and would head straight to track 8. Highly recommended. Posted on August 1, 2012 by Piano. Last modified on January 18, 2016.